With more than 20 years of business experience, Le Luong is a management consultant with a diverse skill set and a vast international network. She is currently the Managing Director at Goals Business Solutions (GBS), a boutique management consulting firm, that specializes in SME business solutions and strategic sales and marketing. Her current projects include partnering with FVES to supply cheap electricity to the crypto mining industry, as well as launching Nurture Growth Bio Fertilizer, a social enterprise to provide an organic and sustainable solution to growers. During her spare time, Le enjoys volunteering with various charities and non-profit organizations. In 2015, Le was appointed as the Vice-President of Vietnamese Association, Toronto and the Vice-President of External Relations for the Canadian Multicultural Council of Asians in Ontario. 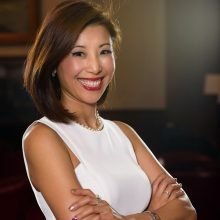 She has also served on the board of the Vietnamese Canadian Professional Association, the Vietnamese Canadian Civic and Voting Association and the Mississauga Arts Council. Since 2014, Le has volunteered with VOICE Canada (Vietnamese Overseas Initiative for Conscience Empowerment), to coordinate the sponsorship of refugees and their settlement. In 2015, Le co-chaired Vietnamese Canadian for Lifeline Syria, a VOICE initiative, where she worked with business and community leaders to raise $130,000 to sponsor four Syrian refugee families. She is currently coordinating the sponsorship for the parents of one of the Syrian families as well as a group of Vietnamese asylum seekers in Indonesia.